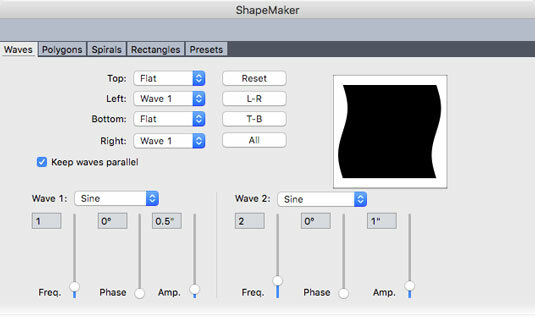 The ShapeMaker Waves tab dialog box. On the Waves tab, you create boxes with wavy sides by choosing from drop-down menus how you want the top, bottom, left, and right sides of the box to appear. The buttons to the right of the drop-down menus let you reset or apply shapes to various combinations of sides. 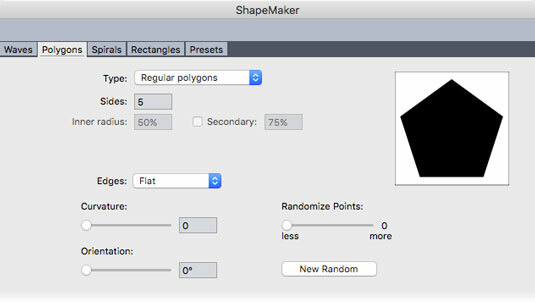 The ShapeMaker Polygons tab dialog box. The Polygons tab lets you create boxes with multiple straight sides, as shown. The settings on this tab require you to choose what type of polygon you want (polygon, star, polygram, spirogram, golden rectangle, and double square) and then set parameters for that shape. The Golden Rectangle shape is particularly useful when you want to create a rectangle based on the golden mean. Even if you don’t know what a golden mean is, it’s fun to play around with the options in the Polygons tab! 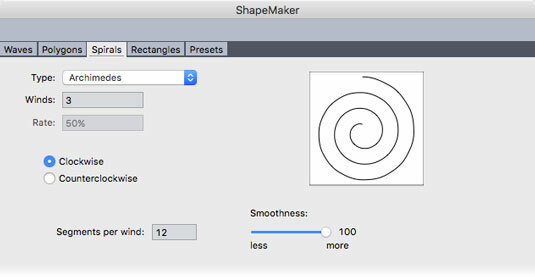 The ShapeMaker Spirals tab dialog box. The Spirals tab lets you create spiral lines, as shown. Among the options in the Type drop-down menu are Archimedes (for a uniform distance between arms) and Golden, which you can use to create your own snail or nautilus shell. To make the resulting spiral be a path you can add text to, choose Text Path from the Item menu. 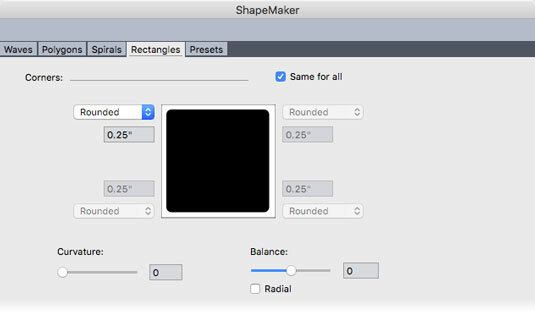 The ShapeMaker Rectangles tab dialog box. The Rectangles tab lets you create rectangular boxes with customized corners, as shown. The drop-down menu lets you choose a corner type (Normal, Rounded, Beveled, Concave, Pointed, or Inset) and a diameter for the corner effect. If you want to create a rectangle that has fewer than four rounded corners, use ShapeMaker — it’s far easier than trying to draw one with the Pen tool or trying to combine shapes with the Item →Merge Or Split Paths menu item. 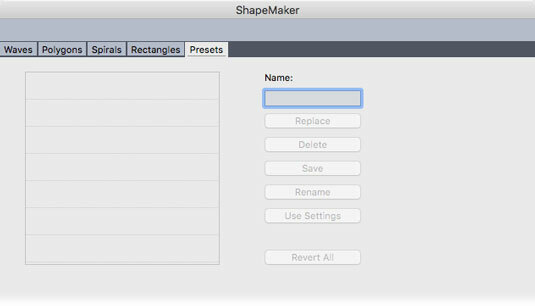 The ShapeMaker Presets tab dialog box. To store all the settings in all the tabs: Type a name in the Name field and click Save. A named preset is added to the list on the left, with (oddly) an image of the shape from the last tab you were looking at. To load a set of saved settings: Select it in the list on the left, click Use Settings, and then click any tab to use those saved settings. To replace the settings in a preset with the settings currently in the ShapeMaker tabs: Select the preset and click Replace. To delete a preset: Select it and click Delete. To rename a preset: Select it and click Rename. To restore all tabs to the settings they had when you opened the ShapeMaker dialog box: Click Revert All.